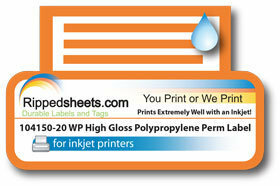 This printable waterproof White Gloss Polypropylene label for inkjet! Using an Epson inkjet printer with Durabright Ultra inks, in an outdoor test which has lasted over four months. The inkjet printable face stock is White Gloss Polypropylene and resists degradation from scuffing, weak chemicals, and wide temperature fluctuations. 104150-20 prints extremely well in color and black and white inkjet printers. The 104150-20 bonds to high and low energy plastic surfaces. The adhesive is an acrylic, adaptable to many surfaces with a minimum application temperature of 50°F and a service range 0 °F to165°F.